Tim Laman speaks regularly for a great variety of groups. 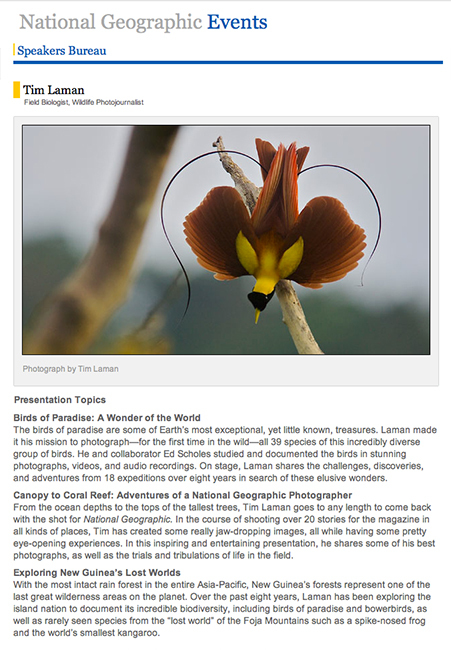 Local camera and birding clubs, major National Geographic lectures to audiences of a thousand, a scientific conference in Indonesia, a photo workshop in China, and a corporate advertising group in Tokyo have all been on his schedule recently. Tim is sure to entertain and inspire your audience with his blend of striking images and video and his stories and experiences from the field. Tim is represented by the National Geographic Speakers Bureau. You can contact the office with any questions or contact the National Geographic Speakers Bureau.